My first impression of Rick Buker's new book Total Penguins: The Definitive Encyclopedia of the Pittsburgh Penguins: Holy Frank Pietrangelo, Batman! At over 700 pages, this is a really big book - a true encyclopedic history of the Pittsburgh Penguins. I think I equally floored at the low price for such a thick book - jacket price of just $29.95 US which means you can usually get it for just $20 bucks at most bookstores and online sources. I immediately assumed this book must be overwhelmingly filled with endless statistical entries. Again, I was surprised to find that was not so much the case. I mean, there is a lot of stats presented here, but it is spread throughout, nicely complimenting a wealth of written history that makes this book a true must have for any Pittsburgh Penguins fan. There is also a nice nod to other notable Pittsburgh hockey teams over the years. 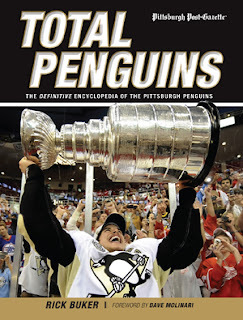 The bottom line is every serious Pittsburgh Penguins fan will want Total Penguins: The Definitive Encyclopedia of the Pittsburgh Penguins. Every fan wishes their team had such an amazing resource for their team, Pittsburgh fans, consider yourself lucky. Don't pass up a look at this title! Total Penguins: The Definitive Encyclopedia of the Pittsburgh Penguins is the definitive resource on the Pittsburgh Penguins, one of the NHL's most popular and successful franchises. Featuring author Rick Buker's exhaustive research and hundreds of exclusive photographs courtesy of the Pittsburgh Post-Gazette, Total Penguins traces the franchise's history from its birth as an expansion team in 1967 to its flirtation with bankruptcy in the 1970s to the arrival of Mario Lemieux in the 1980s and Sidney Crosby in the 2000s, two acquisitions that have led to a golden age of Pittsburgh hockey.